It's still September. Yeah, I know. But I couldn't wait to start decorating the house (inside and out) for Halloween! Last year, our porch decor was a HUGE HIT. We had many people stop their cars in front of our house to trick or treat, then get back in and go on their way. It definitely had the WOW factor. This year, we're going with a slightly different theme...and I promise to show it when we're done. It will definitely be more on the creepy side. Inside the house, however, I am trying to keep it on the Halloween/fall side so I don't have to transition as much in to Thanksgiving. While yard sale shopping this summer, I bought a ton of decorations for Halloween, Thanksgiving and Christmas. 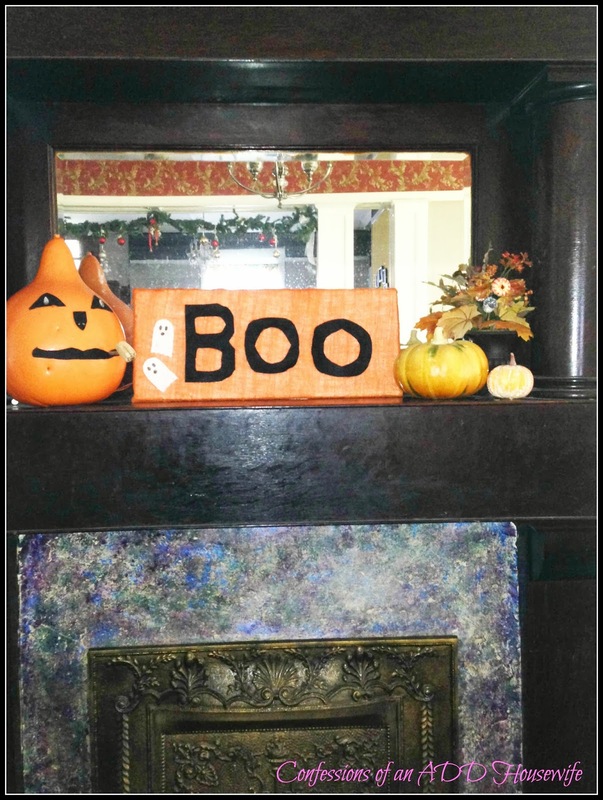 I love the Boo sign :) It's just burlap and felt over a piece of wood. Very easy to replicate and a kid friendly project for sure. 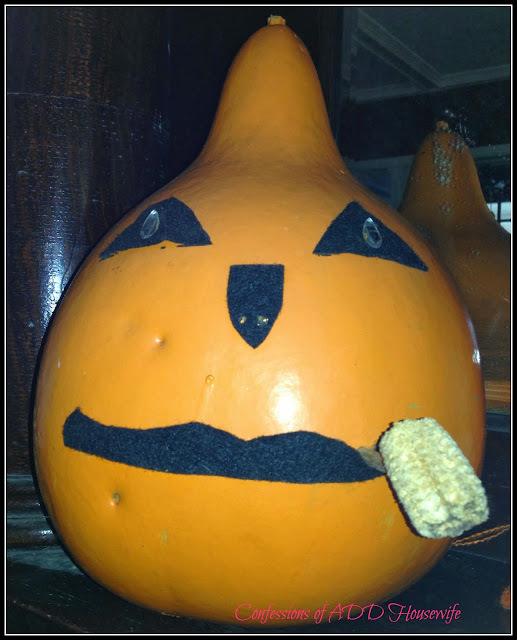 Mr. Gourd was a gift from my neighbor. She's always making craftiness and bringing it to my house. I'll be sharing the outdoor Halloween mantle this weekend. I need to add a few ghoulish touches to make it complete. Fantastic. 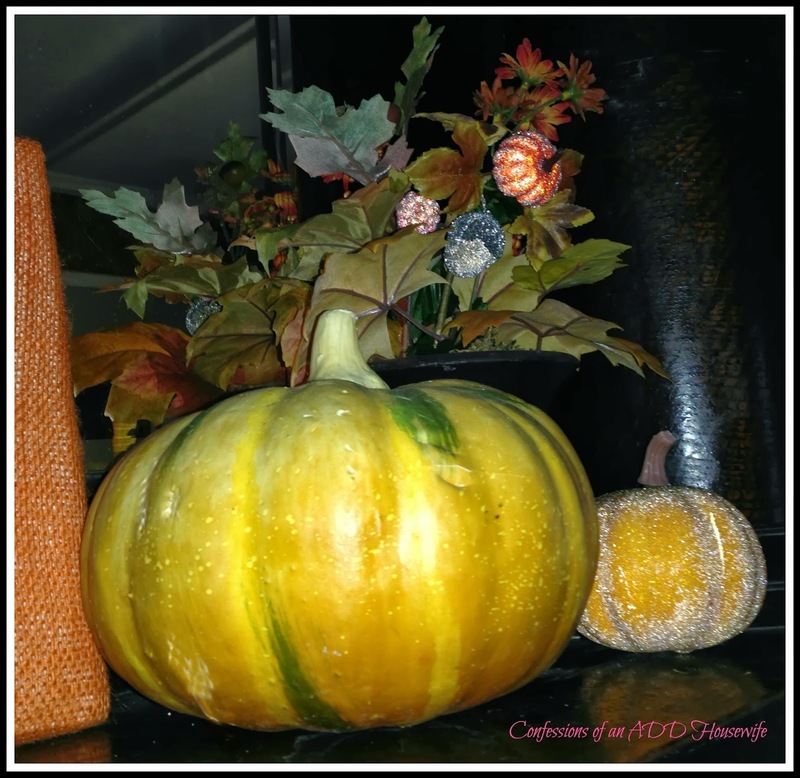 Great idea, to look for decor at yard and thrift sales. The mantel looks great and the burlap covered board, as you said could be used in so many ways. Thanks for sharing. Can't wait to see the yard decor!